Merrill Edge is a well-known US brokerage that is owned by Bank of America. It bridges the retail investor with their Bank of America account, assuming they have one, allowing simplicity when it comes to investing. While you do not have to be a Bank of America customer, it does simplify the entire process. Merrill Edge is recognized for excellence by several major publications in the United States. If you are looking for a place to put money to work for the longer-term, Merrill Edge gives you the ability to do so in a multitude of markets, without a minimum investment necessary from one brokerage account. Merrill Edge should probably be thought of as a place to invest, rather than to trade. This is because, like many other retail brokerage houses, the fees will cost far too much for day trading. If you’re looking for something along the lines of retirement account, Merrill Edge certainly can work for you. The online broker has award-winning research tools and insights available to their customers. This fits in quite well with the average retail trader who wants to simplify the investing process. Furthermore, Merrill Edge understands that investing is a long-term game and not something that you are jumping in and out of. Merrill Edge offers a couple of different investment opportunities, such as the self-directed investing account. Beyond that, clients can use Merrill Guided Investing, the financial advisor of Merrill Edge for a nominal fee. Ultimately, this gives you the ability to open up retirement accounts, 529 College Savings Plans, small business 401(k)s, SEP IRAs, as well as simple investing accounts. Merrill Edge Market Pro is the leading platform that traders will use, although there is a mobile version as well. It features real-time quotes, real-time market analysis. Furthermore, global research and a multitude of charting options are available. The use of the software is free if you trade 15 times per quarter, or if you maintain $50,000 or more in your Bank of America and Merrill Edge investment accounts. Otherwise, you are using a web-based platform that is very rudimentary, but if it is a longer-term investment you don’t necessarily need to have all the bells and whistles of a live and streaming platform. While the Market Pro platform is rather robust, you should keep in mind that you can also get a lot of these features freely available online. At the end of the day though, if you are a long-term investor, you don’t need tick by tick market data. If you are looking for a platform that is for day trading, this isn’t going to be the one for you simply because of the commissions anyway. Merrill Edge allows you to trade multiple asset classes including stocks, ETF markets, mutual funds, fixed income, and bonds, as well as options. If you are looking for simplified investing, you can get a list of funds that are “buy-rated”, doing all of the thought processes for you ahead of time. However, keep in mind that there is no guarantee of performance. There are also managed portfolios that you can invest in. However, this is more or less a washing of your hands when it comes to making the trading decision. There are a couple of different levels starting at $5,000, expanding to $20,000 for even more services. Merrill Edge has high commissions for short-term trading, unfortunately. This is why it is to be used by investors and not traders. If you are a longer-term investor, then the $6.95 charged for stock and ETF trades is typical, and therefore is neither here nor there. However, if you start trading short term, your costs will eat your profits. Options are charged at $6.95 per online trade, plus $0.75 per contract. Bonds and fixed income trades are $1 per transaction. You will find that these are pretty much industry-standard when it comes to this type of brokerage. ​Clients have access to trading courses that will give them further knowledge and understanding of stocks, ETFs, mutual funds and bonds. As Merrill Edge is dedicated to retail investing, there is an emphasis on education and research. ​Most retail investors are looking for professional help to sort through the financial details of the company, and Merrill Edge delivers them. The research team is well known, and you will see their analysts appear regularly on Television. There are plenty of other tools such as the Merrill Edge stock screener. With the stock screener, you can search for stocks by key numbers like EPS and revenue growth, with extreme detail. This is one of the better tools that they do offer, and as the retail tool world goes, this is probably one of the better ones. It’s clear, concise, and can be configured to whatever type of filter you choose. However, it is not an Artificial Intelligence stock screener like Trade Ideas. So it does the basics. Not more, not less. There is also a lot of professional analysis and perspective that you can rely on. This will give you the opportunity to invest as the professionals are looking to invest. There is also the “US 1 List”, a list of buy rated stocks recommended by Bank of America Merrill Ledge Global Research Analysts. Beyond that, there are plenty of webinars and videos that customers can watch to get a grasp on stock investing as well as other financial instruments such as options. 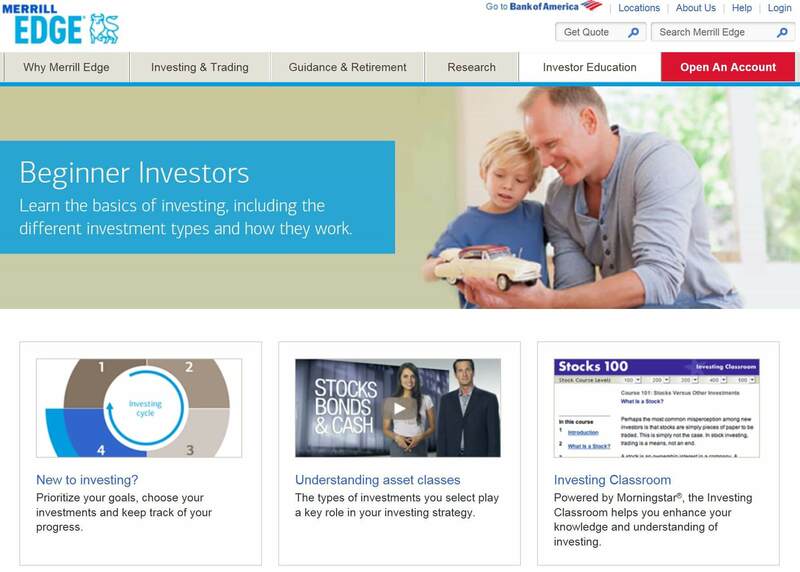 The investor education section is rather large, and even breaks down the education and information in beginner, intermediate, and advanced levels. They go beyond that and break up investing by life stage, and even get into budgeting and debt management. Ultimately, the education section at Merrill Edge is probably one of its most compelling reasons to be involved. Customer service is handled by the telephone. You can reach the support 24/7, and of course on a multitude of branches around the United States. You could also email Merrill Edge or schedule a free consultation. JD Power and Associates have recognized Merrill Edge for the outstanding customer service experience eight years in a row, showing just how strong their customer service situation is. ​Merrill Edge is a place where retail traders will find plenty of information, support, and of course can trade US markets. It should be noted that only American markets are serviced, but in most cases, that won’t be a barrier. The brokerages well respected and highly regulated as you would expect, as Bank of America owns them. One of the negatives will be more expensive trading fees. Short-term traders might prefer brokerage houses like Interactive Brokers or SureTrader. However, if you are an investor, you will find that the fees are right in line with everyone else. The education section, of course, is by far probably one of the most notable bonuses to trading at Merrill Edge, so keep that in mind. If you’re looking for a brokerage that you can build a retirement account, then Merrill Edge may be the place for you. You can learn to invest based upon the time of life you are in and depending on your goals. If you like, you can even open multiple accounts like investment accounts, retirement accounts, or accounts for college savings plans. Merrill Edge is very intuitive. The professional trading platform is only for free if you have a certain amount of money invested. In general, this online broker is probably best looked at as a place to invest. It is the right place for investors who do not want to make their trading decisions every day. People who are looking for some guidance in their investing decisions should take a closer look at Merrill Edge. Beyond that, the customer service is second to none and the 24/ support a considerable benefit of trading at Merrill Edge.